What happens when you combine glowing candlelight, clay from the earth and beautiful hand cut windows designs inspired by nature and historic Salem and regional architecture? The melding of all these elements has evolved into my two Dot’s Pots lantern series; the architecture, nature series and travel series. The lanterns are a delightful addition to any room of your home as the warm candlelight spills onto table surfaces and window patterns dance on walls nearby. In this world of mass produced products that are made cheaply overseas with little attention to craftsmanship and creativity, I like to think that there is still a market for unique hand made pottery made locally with care by American craftsmen. With that in mind I have developed a line of Dot’s Pots ceramic gifts including garlic graters, jewelry holders, yarn bowls, napkin rings, chip and dip servers, sponge holders and olive oil bottles. 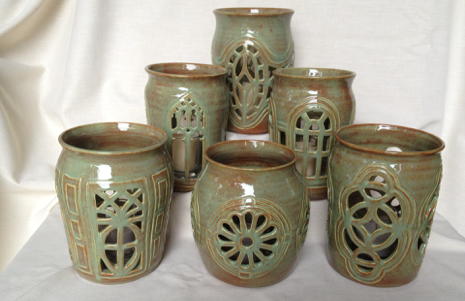 New products and seasonal lantern designs are periodically added to the collection. All my wares are made from start to finish in in my home studio in historic Salem, Massachusetts. I am currently selling my wares at stores on the North Shore and at local crafts shows and local farmer’s markets. I love meeting my customers and personally sharing the stories that have inspired my pottery. Thank you for visiting my site and for your interest in supporting hand made crafts made by American artists. I hope to meet you at an upcoming event.